A guard is beaten up, one office destroyed. 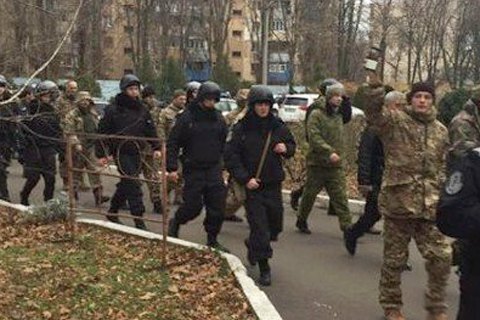 Twenty people wearing camouflage fatigues stormed in the morning of 22 November the office building of the Odesa customs, battered a guard and smashed one of the offices, the National Police in the Odesa region said in a release Tuesday. Police promptly arrived on the scene to prevent the conflict. All the detained were transported to a district police station, where law enforcers establish their identities and the circumstances of the accident. Interfax-Ukraine said with a reference to a police source that the attack was related to the activities of a company, engaged in export-import operations. The attackers thus tried to "reach an understanding" with the customs authorities. According to the local publication Dumskaya, the attackers belong to a certain All-Ukrainian Council for the Fight against Corruption Smerch, headed by one Anatoliy Budnyk. All members of the group are ATO veterans. As a result of the raid, the office until recently occupied by head of the Odesa customs Yuliya Marushevska was ruined. Head of the Odesa public organization Public Security Council, Mark Hordiyenko, wrote on Facebook that the detainees were involved with the "nut mafia". "A stray gang from Kyiv, under the guise of camouflage and a loud name Smerch (Tornado), signed up for a racketeer job for the Sunrise company," he wrote. On 14 November, the head of the Odesa customs Yulia Marushevska filed a letter of resignation. However, the head of the State Fiscal Service Roman Nasirov said that Marushevska may resign only upon the formal transfer of all paperwork. According to Interfax-Ukraine, Marushevska has not showed up in the Odesa customs offices ever since the announcement of her resignation.